To download documents, create a new account or log in. Precipitation Products Report; doi:10.7924/G8MW2F2W. Click to download. Atmospheric Forcing Datasets Report; doi:10.7924/G8RN35S6. Click to download. Landscape Attributes Dataset Report; <doi:10.7924/G8H41PBG. Click to download . 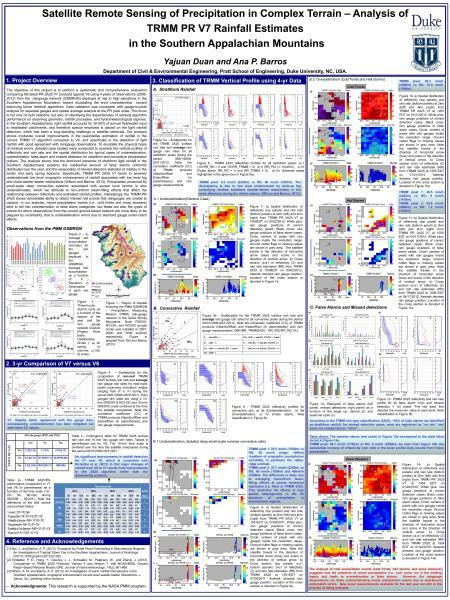 Poster presentation at the 6th International Workshop for GPM Ground Validation , 5-7 November 2013, Rome, Italy. Duan, Y. and Barros, A.P., 2013: Satellite Remote Sensing of Precipitation in Complex Terrain - Analysis of TRMM PR V7 Rainfall Estimates in the Southern Appalachians .